BOGEN. -- In Cambria, April 12, 1883, Mrs. Matilda Bogen, wife of Patrick Bogen, aged about 70 years. HALL. -- In Conemaugh Borough, Sunday, April 8, 1993, Harry, son of Mr. and Mrs. William Hall, aged 4 years. HOTSIN. 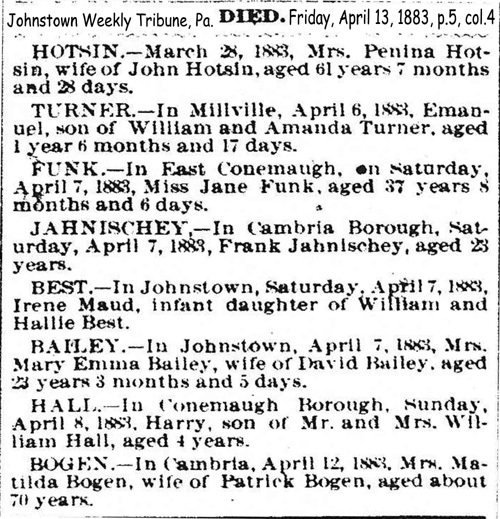 -- March 28, 1883, Penina Hotsin, wife of John Hotsin, aged 61 years 7 months and 28 days.